Rock trio Rush have been named the greatest live act of all time by musicians and music fans. The Canadian band, formed 40 years ago, triumphed ahead of second-placed British heavy rock stars Iron Maiden. Musician's website MusicRadar.com held the poll ahead of next weekend's Glastonbury Festival with prog act Rush taking a third of all the votes. Despite being one of the biggest money-spinning live groups in the world today, U2 finished in 10th position with less than three per cent of the 13,000 votes cast. British stars Muse, long renowned for their shows, finished in sixth spot. Hard rock act Guns N'Roses - who landed disappointing reviews after their Chinese Democracy comeback - were in third position. Rush have been a major live draw since making their mark with their self-titled debut album in 1974 and the band have been praised for their complex compositions and the proficiency of their musicianship. Will Groves, editor of MusicRadar.com, said: "Festival season is in full swing and the massive amount of votes cast in the MusicRadar poll reflects the enthusiasm and passion our readers have for live music. "With Glastonbury just around the corner, the poll has galvanised live music fans. 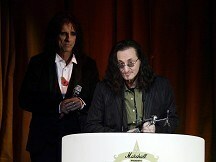 Rush are deserving winners after nearly 40 years on the road."